OTTAWA—Henry Burris found Greg Ellingson for a spectacular 93-yard catch-and-run touchdown with 1:25 left to play in the fourth quarter sending the Ottawa Redblacks to their first Grey Cup since 1981. 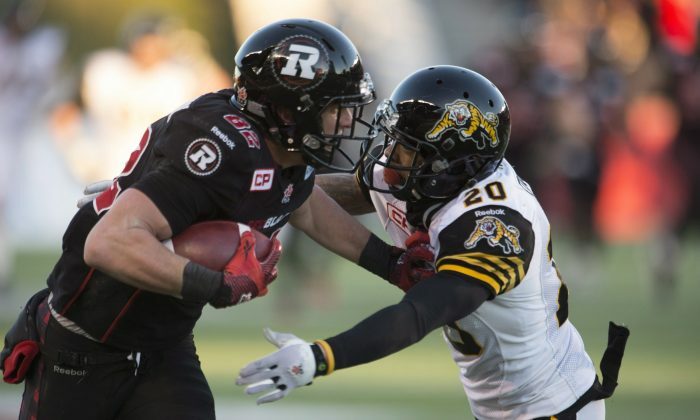 Ottawa defeated Hamilton 35–28 in a back-and-forth thriller that saw the visiting Tiger-Cats tie the game with just under two minutes left. It was the type of dramatic finish the CFL has become known for. And for Ottawa, it’s yet another exclamation point on what has been a remarkable turnaround of a season. The Redblacks turnaround—winning 10 more games than last season—is the second-highest year-over-year improvement in CFL history. With a 12–6 record, Ottawa clinched its first division title since 1978. “The whole thing’s a pretty cool deal when you think about it,” said Ottawa head coach Rick Campbell. “It’s unreal. It’s what…over 30 years for Ottawa to have a home playoff game and to win it in the fashion that we did, it’s just a testament to this team,” Ellingson said. So often in big football games, it comes down to making a big play when needed and having the belief that such a play can be pulled off. Late in the fourth quarter in a tie game, Ottawa was facing 2nd-and-25 from their 17-yard line with the prospect of punting the ball back to Hamilton who would get good field position. What we went through last year, there’s a lot of hunger in this locker room. “When Jason [Maas, offensive coordinator] called the play, we had the utmost confidence that he’d make the play,” Burris said about Ellingson. And sure enough, Ellingson did and Hamilton’s defensive back on the play, Ed Gainey, lost his footing giving the Redblacks’ wideout a good start for his 58-yard run to the endzone. It was a tough loss for Hamilton who had battled back with Jeremiah Masoli having a 349-yard passing day. “Difference is we didn’t make the plays,” Hamilton head coach Kent Austin said. “Every loss is difficult—especially a game you had a chance to win. For the Ti-Cats, critical penalties proved costly and none more so than an offside call that negated a 25-yard TD pass from Masoli to Luke Tasker at the start of the fourth quarter. Canadian football fever has returned to Ottawa in a big way and winning is certainly a large part of that. A sold out crowd of 25,093 was put through an emotional rollercoaster, but came away happy in the end. Ottawa’s offense lit it up in 2015. The Redblacks set a new CFL record for pass completions in a single season with 499. Burris had 481 of those, also a single-season high mark. With those completion numbers, Ottawa had four 1,000-yard receivers. Never before has Ottawa even had three 1,000-yard receivers. In a curious end to the season, Ottawa played Hamilton twice in the final two games—and beat the both times. They ended the regular season on a four-game win streak, something an Ottawa team hadn’t done since 1991. Burris, a long-time Stampeder, won Grey Cups with Calgary in 1998 and 2008. But after his first season with the Redblacks, getting to another Grey Cup might have been the furthest thing from his mind. “What we went through last year, there’s a lot of hunger in this locker room,” said Burris. Ottawa last won the Grey Cup in 1976. In their last Grey Cup appearance, the Rough Riders, as they were known back then, lost in the 1981 final to Edmonton. From here, it’s onto the 103rd Grey Cup in Winnipeg next Sunday. And it’s perhaps appropriate that they’ll face Edmonton again, the CFL’s top team in the regular season who handily beat Calgary in the West Division final. “These guys are excited. The city is excited. We’re going to soak it all up,” Ellingson said. Labour Day is one of the year’s biggest days for sports.